This technique is a great way to enjoy breasts cut from more flavorful heritage chickens. 1. Season the skin-on breast generously with salt & pepper. If using a skin-off breast, lightly flour it before seasoning. 2. Put a sauté pan over medium-high heat. Add grapeseed, peanut or canola oil to coat. 3. When oil begins to smoke, add the chicken breast skin side down. 4. Turn heat down to medium. Sear for about 10 minutes skin side down. 5. 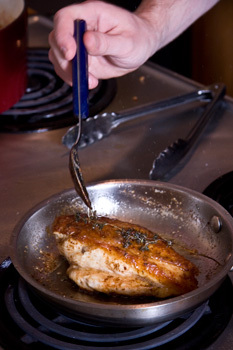 Flip the breast and discard excess oil. 6. Add a tablespoon of butter and a couple sprigs of fresh thyme. 7. Continue cooking on low-medium heat. Baste every couple minutes. Cook this way for another 10 minutes. 8. Remove from heat and let sit for 5 minutes. 9. Slice and dust with your favorite seasoning salt.